This book is like a slice of perfect cake: light, fluffy, delicious and ideal to enjoy when curled up with a nice up of tea. 4/5 stars. Yes, I know this is an enormous picture. But LOOK at that cover! 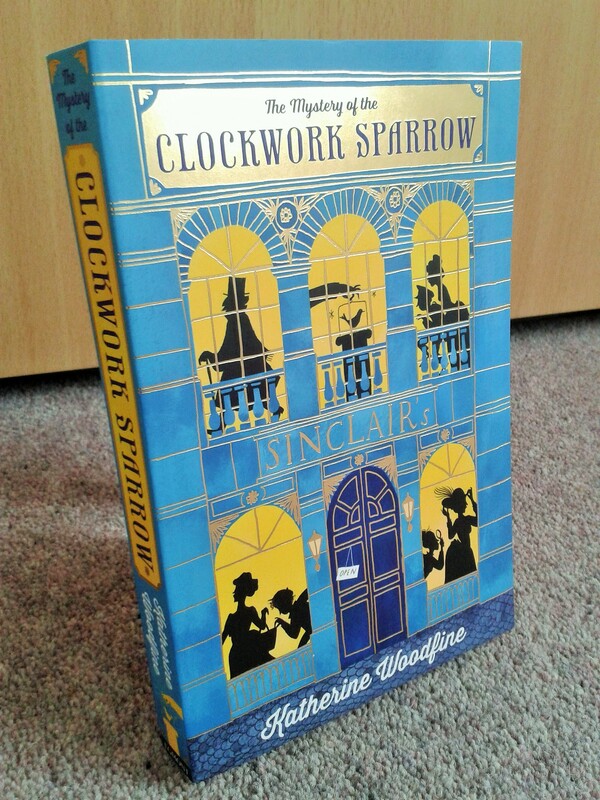 I was lured towards this book by the delightful, gold-embossed cover. 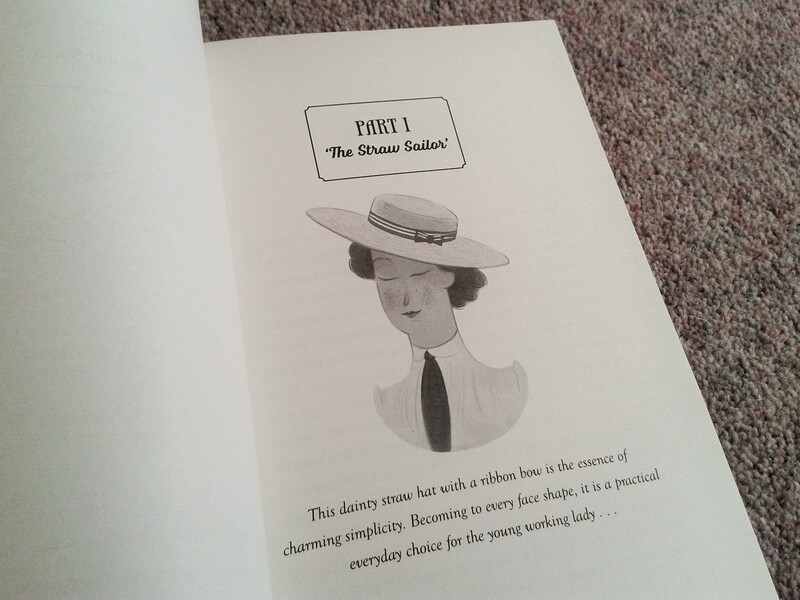 Inside, the story is also peppered with cute illustrations. And “cute” and “delightful” are good words for this story. 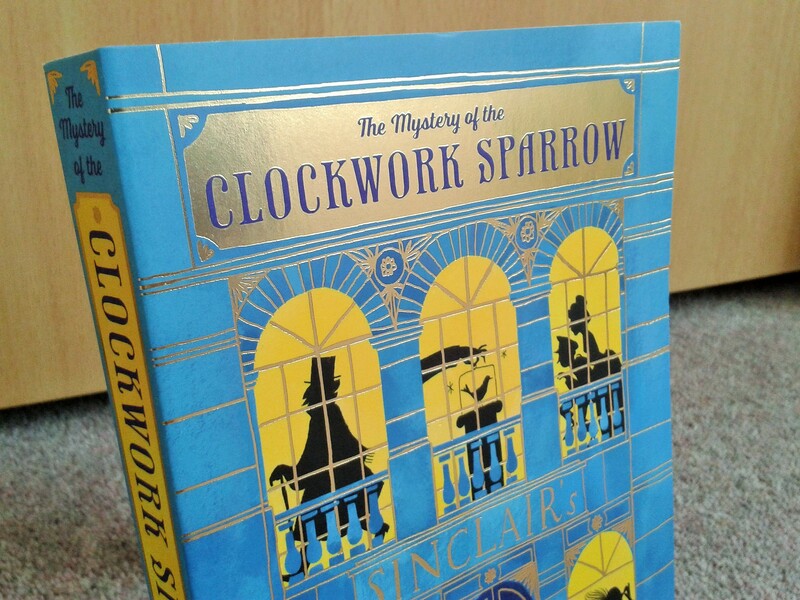 The Mystery of the Clockwork Sparrow is what you get if you mash together Nancy Drew, The Famous Five, Sherlock Holmes and set the action in a glittering London department store at the start of the twentieth century. Special mention to the illustrator Júlia Sardà – beautiful work. Sophie, our heroine, is wonderful. She’s going through a rough time and having to grow up much earlier than she should. But she gets on with it without complaining or feeling unduly sorry for herself. I warmed to her instantly. She’s brave, smart and resourceful. Not bad for someone who just turned sixteen and has to elude danger in a corset and long skirts. 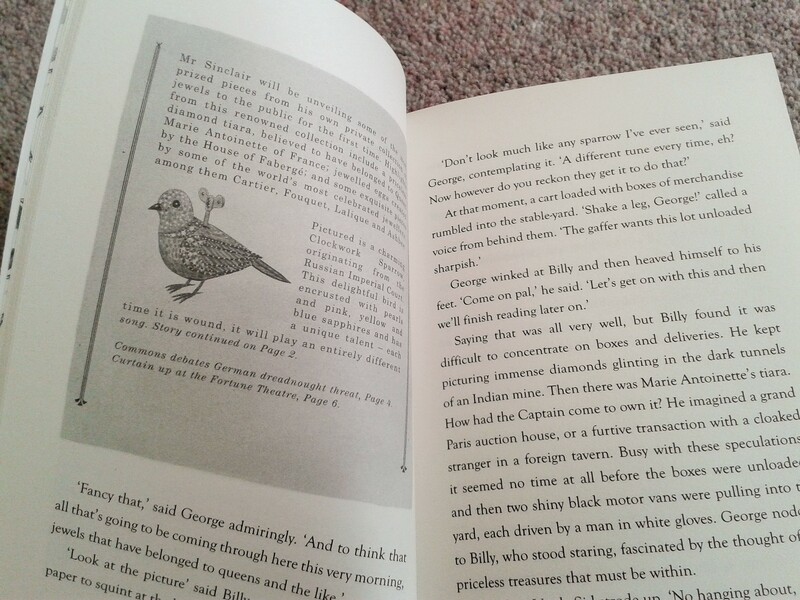 One of the illustrations separating the parts of the book. The villains are properly dastardly and their plot is diabolical. But, of course, you know that this story operates in a universe where nothing truly bad can ever happen and all will be well. This is a fictional world where our characters find themselves in life-threatening situations and the worst thing they come out with is “Gosh!” or “Golly!”. As a result, the story is a warm, relaxing read. If you’ve just finished a hard-going or traumatic story, I would prescribe this book as an antidote. I guess this book is supposedly YA because all the main characters are in their mid- to late teens. That said, I didn’t think their ages mattered at all. This is a proper, old-fashioned mystery in the vein of Miss Marple where the mystery and intrigue are the focus. Another illustration, featuring the eponymous sparrow. So if it’s so enjoyable, why didn’t I give it 5 stars? Probably because there is nothing terribly original here, as you my have guessed from the many references I have made to other books/series. Also, though it is very well-written and entertaining, it’s not as gripping as I need a 5-star book to be. Love the cover… and my inner child is very tempted! Ah this sounds nice! And relaxing! I’m reading Kafka’s The Trial at the moment, so may well need your prescription after it. Nancy Drew…I’d forgotten about her! I was a big fan! Wow, what a lovely cover! It looks so playful. This looks the light read I’m looking for at the moment. 🙂 Thanks for sharing Claire! You’re welcome. I’d be surprised if this failed to cheer anyone up. And after a few YA books where the heroines are prone to a lot of moaning, it was refreshing to have a young lady heroine who refused to mope. I know! 🙂 I wanted to give special recognition to the illustrator, Julia Sarda, because often the cover illustrators don’t get any/much recognition for their wonderful work. This sounds like the perfect pick-you-up book! Great review and I love that sumptuous cover! I hesitated a few years ago to buy it… But I have to admit that with your review, I just want to read it now !